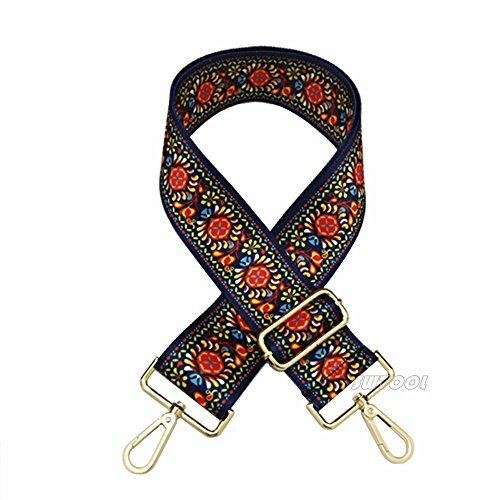 Selling Wonderful 2'' Wide 28''-50'' Adjustable Length Handbag Purse Strap Guitar Style Multicolor Canvas Replacement Strap Crossbody Strap, With 2Pcs Gold Metal Buckles (Style9) by SWTool at Designers Artists. MPN: 4336839926. Hurry! Limited time offer. Offer valid only while supplies last. Length Adjustable, From 28" to 50", Strap width 2". High quality gold metal buckles,Ensure the installation sturdy. Buckle length: 4.5cm(about 1.8"); Snaps fit bag rings up to 8mm in thickness or smaller. Package weight:118g . Lightweight and sturdy. If you have any questions about this product by SWTool, contact us by completing and submitting the form below. If you are looking for a specif part number, please include it with your message.